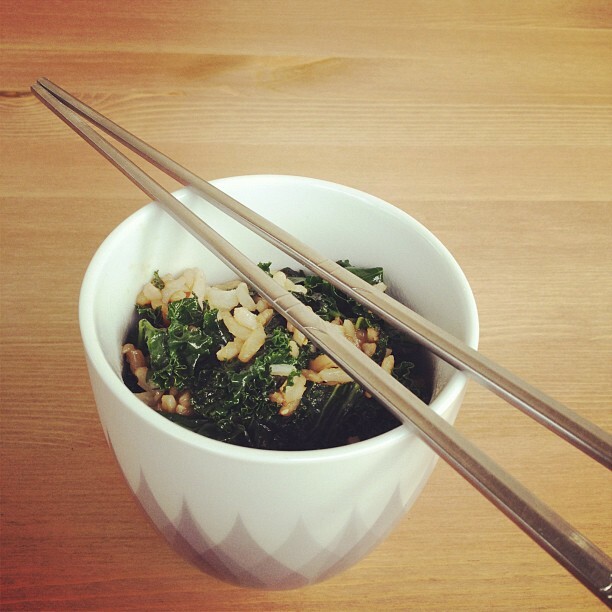 This is a delicious way to add some flavour and nutrition to your rice by adding some greens, garlic and soy sauce. The recipe is in Gwyneth Paltrow’s My Father’s Daughter. I just made it a little simpler by cooking it all in one pan, and upped the ratio of kale to rice, going heavier on the kale. Can’t get enough of the greens! 1. Heat the olive oil in a large frying pan, then throw in the sliced garlic. Let it cook for a minute, then add the chopped kale. 2. Add a little water to the pan, then throw a lid on it for a few minutes until the kale is wilted. 3. Push the kale to the sides of the pan and add a little more olive oil. Throw in the rice and let it cook until it gets a little crispy, stirring from time to time. 4. Add the scallions and soy sauce, to taste.